I'm so excited that it's December 1st! I feel like I can officially decorate for Christmas and fully embrace the Christmas spirit now. To start things off, we're decorating our tree tonight! We have a fake tree, but I always keep this candle lit so we have the smell of a Christmas tree, and no one knows the difference! 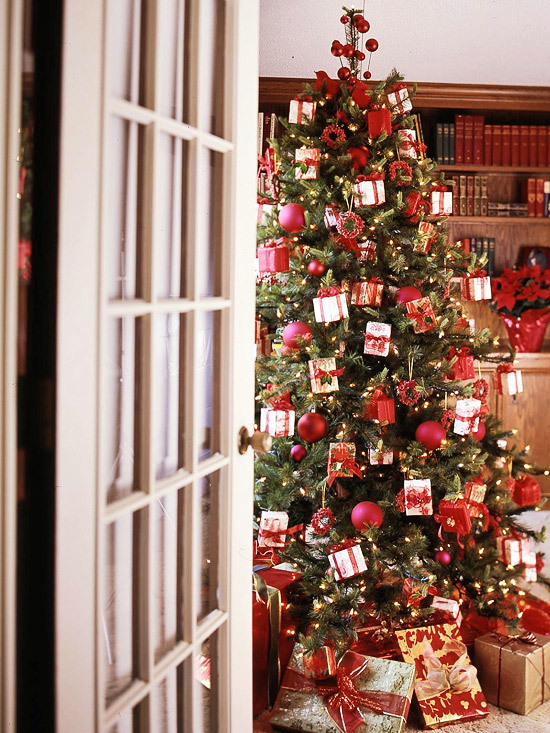 Do you have a real or fake tree? Is your tree up and decorated? We have been cutting down our own Christmas trees almost every year since we've been married, and it's always so much fun! Love your tree inspiration, have fun decorating! We do real trees every year! I couldn't stand to have a fake one I don't think although the lack of pine needles everywhere would be nice. I just love the smell of a real one and the excitement of picking one out. Another great roundup! I love the one by The Inspired Room! 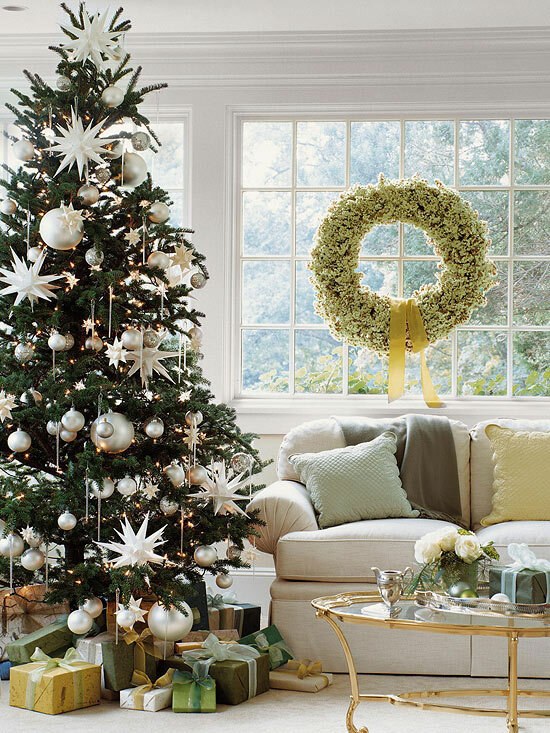 I would love to do a real tree, but I have a fake one (a Martha Stewart one, oddly enough)! My parents do real ones though, so I can always smell theirs =). My tree has been up since the weekend before Thanksgiving! I like to enjoy mine as long as I can. We're debating on whether or not we even want to put one up this year. Normally we put ours up the day after Thanksgiving, but this year we just aren't much in the Christmas spirit. Maybe that will change later in the month though. Oh I just love that peacock tree! I forwarding that to my sister. We're going to get our tree this evening. Phils been out of town so I decorated our 3 mini artificial trees, and since he is back with his manly strength we can go get the "Big tree" lol Can't wait to see your tree! Fake or real? This has been a debate since the day my hubby and I have married! I always grew up with fake and he grew up with real. I have no desire to trek out in the cold to chop my own tree down and deal with all of those needles on my rug...LOL He's come around to embrace our artificial tree! We put ours up over TG break. Have fun! Speaking of Christmas tree smells, there's a new thing out called "sentsicles" and they're a little green stick that you hang from your tree and it's pine scented. They have them at Target. You should check them out! Beautiful pictures! I love the look and smell of a real tree in the house! Just adds to the christmas spirit! We do real trees....but I don't have it yet. We're going to go this weekend. However when I do have a bigger house I think I'll do two trees...one real and one fake. The peacock feather tree is really fun! We get a real tree. We are helping with a Christmas tree lot to raise money for a non-profit this year so we will definitely be piking ours up there. I'm hoping that will be this weekend! These Christmas trees are gorgeous!! 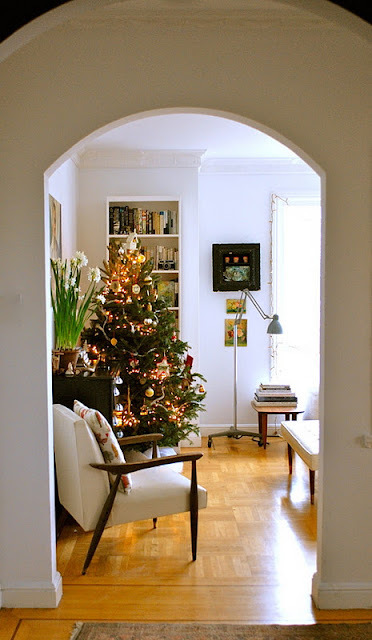 Does it make me a bad Jew to love pretty sophisticated Christmas trees? I was like a small child oohing and ahhing last night when the NBC tree was lit! Pretty! My mom used to help with an interior design place and so she always had the most lovely Christmas trees. Then as we grew up we wanted fun trees and she stopped. Now that we are out of the house she has the most awesome and colorful tree...reminds you of Dr. Seuss tree! What lovely photos! We don't have our tree up yet (sad face) but I HOPE to get it all set up this weekend :) We are cutting down our own, which should be fun! oh i loved this post. so, so much. because what's better than a christmas tree?! i go with the real trees - and have gotten one each year i've been in nyc. it's quite different from my childhood though - i get a 3 foot tree, the smallest i can find, at the corner bodega. i mean, i never saw myself getting the smallest christmas tree at basically my neighborhood convenience store as a young girl, but such is the new york life. We always go for the real ones. This year we were blessed with 'trees for troops' and got a free tree! It's up in the living room and we're planning to decorate it tonight. I can't wait to turn off all the lights and just sit with the white lights on and listen to Christmas music. Love this time of year! I love real Christmas trees, but I hate setting them up. This year, I'm going for a small, fake tree that requires no decorating (I'm a grinch that way). yeah, we have a fake tree too that's going up next Sunday ;-) And I do the same as you, I use scented candles. Well, I also buy a few branches from the florist, just to get the real smell. Yes, the tree and the rest of the house is decorated. I love this season, too :) I'm doing a little Christmas giveaway over on my blog. Will put you in the Christmas spirit even more! Scroll down a post and you will find it. Happy December! Love the trees...there is nothing like a decorated Christmas tree!! We don't have a tree! So pretty! We're just going to put up our little tree since we'll be going home for Christmas in just a few days. I can't wait until we have our first full-size tree!